Despite his young age, Min-su (Jo Dong-in (조동인) is an extremely intelligent and talented baduk (Go) player. To make ends meet and with few prospects, Min-su uses his skills to hustle other players, forming friendships with small-time crooks as well as making several enemies in the criminal underworld. Yet when a local mob boss (Kim Roe-ha (김뢰하) unwittingly challenges Min-su to a duel and loses with significant embarrassment, the gangster hires Min-su as his baduk teacher and the two become close, changing them both irrevocably. First and foremost, The Stone (스톤) is a palpable love letter to the game of baduk, often referred to as ‘Go.’ Director Cho Se-rae (조세래) uses the game as a form in which to emphasise a person’s personality through their technique, as well as to express the evolving relationships between players. Baduk is continually conveyed as something of a gentleman’s game, requiring a cool demeanor and keen intellect to truly master. As such the unlikely bond that forms between hustler Min-su and the gang boss is quite believable, as they converse about increasingly personal stories during their friendly matches. Their tournaments also allow them to gain insight into each other’s lives. The gangster recognises his own tormented youth in Min-su, while Min-su dislikes the path the boss has chosen yet sees it before himself, and as their bond increases they attempt to guide each other while playing. However at nearly two hours in length The Stone is far too long, as the story continually expands to add further menial sub-plots that are quite unnecessary. It is also acutely ironic that with such an excessive running time that the character development is also quite minimal. Despite the fact that Min-su and the gangster are the central protagonists, surprisingly little depth is ascribed to either. Hints are alluded to, such as Min-su’s unrepentant mother who suffers from a gambling addiction, yet there are precious few moments that help to define the characters in any detail, nor give any reason why the audience should care about them. 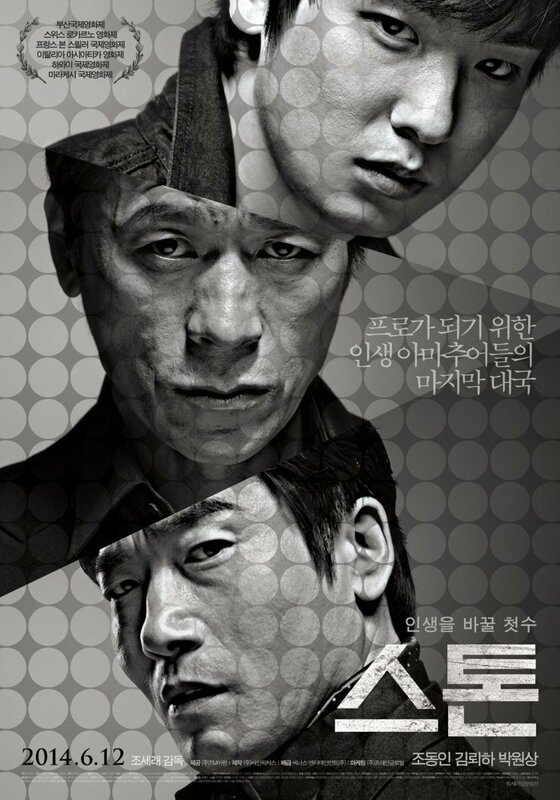 As such the film becomes a series of vignettes about baduk in the criminal underworld, rather than a character-driven study. Luckily Park Won-sang (박원상) is on hand to provide a wonderfully charismatic and humourous performance as the mob’s second-in-command. The actor has risen to prominence in recent years following his roles in Unbowed (부러진 화살) and National Security (남영동 1985), and as a foolish gangster who constantly oversteps his bounds he brings a sense of genuine enjoyment to The Stone. Whenever Park Won-sang appears on screen he overshadows everyone with his performance, yet he is no mere comedic foil as he infuses the character with a deep such of integrity and loyalty, as well as danger, that makes him extremely likable. It is often due to his appearances within the vignette-style storytelling that The Stone becomes an entertaining film. 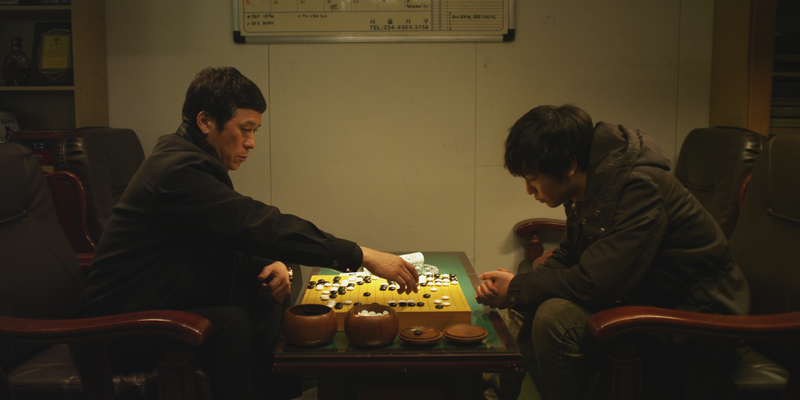 The Stone is an interesting drama about the game of baduk (Go). Conveyed as a gentleman’s game, director Cho Se-rae uses it as a way for characters to develop relationships, as well as a window into the gambling habits of the criminal underworld. Yet the overly long running time and lack of character development, in conjunction with the vignette-style storytelling, stops the film from being a deep and compelling exploration. Actor Park Won-sang makes the film entertaining whenever he appears, yet even with his significant performance The Stone is a rather standard affair.